We found a GREAT article on DeerandDeerHunting.com. Half of it is reposted here with their permission. If you haven’t checked out their site, I highly recommend checking it out and signing up for their e-newsletter. This entry was posted in DeerandDeerHunting.com’s Readers Stories, Research. Bookmark the permalink. Not until last season, when I strapped on a monitor, have I ever considered how hard my heart beats while hunting. Although opinion varies, many doctors caution against exercising at a level greater than 85 percent of a person’s maximum heart rate. This increases the risk of heart attack. Whether you’re hunting or doing other work, don’t let your heart rate exceed 85% of your maximum rate. As a rule of thumb, your maximum rate is 220 minus your age. For men, maximum heart rate is calculated by subtracting age from 220. For me, the equation reads 220 – 21 = 199. Eighty-five percent of that is 169. I found myself battling to keep my heart rate below 169 throughout deer hunting season. Just hiking trails in west Texas, I quickly exceeded my 85 percent maximum. I attained my season high of 201 while pulling a whitetail on a game cart that had two flat tires. My experiences echoed the results of a study conducted by Michigan’s Beaumont Hospital. Published in 2007 in the American Journal of Cardiology, the study fitted heart monitors on 25 middle-aged hunters, 17 of whom had been diagnosed with coronary artery disease. During deer season, all but three exceeded the maximum rate they had achieved on a treadmill test. Dragging downed game raised heart rates to the most dangerous levels, but several men experienced jumps into the red zone simply from spotting or shooting at a deer. According to study co-author Dr. Barry Franklin, the strain hunting puts on the heart is attributed to three factors: hunting’s strenuous nature, the epinephrine (or “excitement”) response upon seeing game and environmental stresses, including cold weather and altitude. Franklin also notes that many hunters in the study exhibited life-threatening heart-rhythm irregularities (aka cardiac arrhythmia) that had not been apparent on EKG readouts during laboratory treadmill tests. This was a disturbing finding. 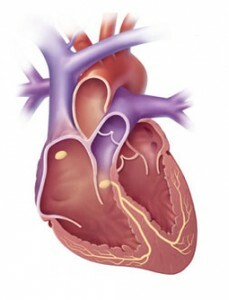 Heart arrhythmia is the trigger for cardiac arrest. So what can you do to keep your heart working during the hunting months?